Bees | Pest Elimination Systems Technology, Inc. Bees are winged insects that can either be solitary or social in nature. Some of the common species of bees include honey bees, bumble bees, carpenter bees, and ground bees. Although bees have a great ecological importance, having a bee hive in or near your property can be dangerous as bees do sting when they feel endangered or when they display the instinctive desire to feed themselves. Bee stings are painful and can trigger certain allergic reactions, that’s why it is pertinent to perform bee control and removal as soon as possible. Sight of communal bee hives: Bee hives are usually seen on trees, upper corners of your eaves, or your outer walls, though note that there are some wood-boring bees such as carpenter bees that make nests right inside wood. There are also bees that nest in the ground. Buzzing sound: The buzzing or humming sound that bees make, especially when they are in a swarm, is easily identifiable. It is usually loud and distinct. Sight of bees: While two or three bees buzzing around your flowers should not concern you, bee swarms will indicate that a bee nest or hive nearby. Bee hive relocation: Unless the bee hive in question is deemed an immediate threat to humans, it is best to perform a bee hive relocation so that the bees will not be hurt. Blocking entry points: It is possible to block the entry points as well as remove the honeycomb in a hive so that other bees will not find the hive again and bring the honey back to another hive. Mortar repointing: For certain species of bees that are solitary in nature, re-pointing with sound mortar is an effective solution because this will prevent the bees from making nests in the targeted area. Total bee extermination: It is possible to use commercial insecticide to exterminate all the bees in the hive. However, this should only be done as a last resort. What types of ants are the most common in the United States? 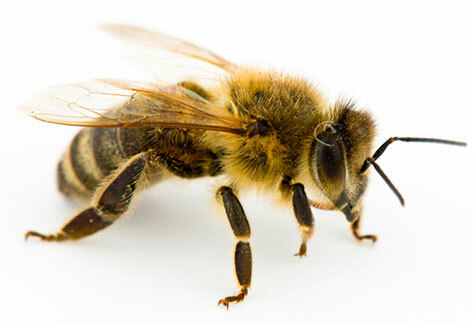 There are more than 17,000 species of bees in the entire world but the most common bees that can be found in the United States include honey bees, carpenter bees, bumble bees, long horned bees, cuckoo bees, squash bees, leaf cutter bees, mason bees, and mining bees. I have been stung by bees, what should I do? First, walk away calmly from the site so that the bees will not sting you again. Get help from someone as soon as possible because you do not know if your body will display serious allergic reactions from the stinging. Any allergic reaction will happen fast and this warrants emergency medical help. If there are no signs of allergic reactions, you can wash the sting sites with water and soap, and remove the stingers if any of them remain. Afterwards, apply a cold compress to help reduce the swelling. I see a bee hive on my property. What should I do before the pest control company arrives? The best thing to do is to leave the bee hive alone, and avoid the immediate area where the bee hive is situated. Make sure to remove your pets from that area too. If it is nighttime, switching off the lights can also help lessen the chances of a bee attack. Need Help with Bee Control Today? Founded in 1987, PEST is one of the leading pest and bee management specialist in New York and the Tri-State area. Whether you need residential, commercial, or industrial bee control solutions, our team of highly trained pest control specialists will arrive on site to make a thorough assessment before making the best recommendations to help you eliminate your bee problem for good. We are Green Shield Certified, and this means that we are committed to performing responsive, prevention-based, and eco-friendly pest removals. It’s time you prevent yourself or your loved ones from being stung by bees. Call us at 212.945.0868 or email us at info@pesteliminationsystems.com to get started on bee control.